Conveniently located in downtown Bangkok's shopping district and steps away from the BTS SkyTrain National Stadium station and the airport rail link, Mercure Bangkok Siam offers 189 contemporary Superior, Suite and Privilege rooms. Facilities include free Wi-Fi, restaurant and bars, swimming pool, and fitness centre. Guests are walking distance from palatial malls, including MBK, Siam Paragon, Central World and Central Embassy. Many of the city's cultural highlights are also nearby. 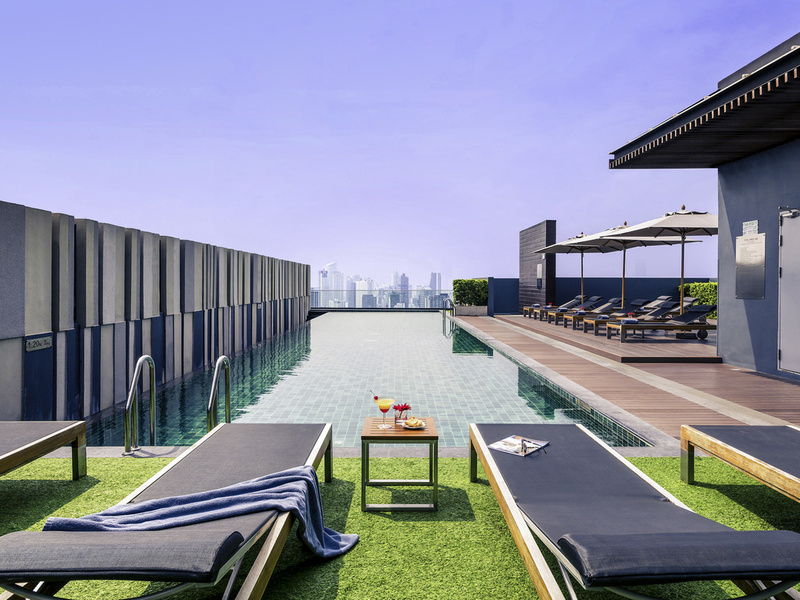 Mercure Bangkok Siam is located in Bangkok's best shopping district. Guests are a short walk from the renowned MBK mall, the palatial Siam Paragon mall, Siam Ocean World and Siam Square. Jim Thompson House is steps away and cultural highlights such as Located in the heart of Southeast Asia, Bangkok is a modern and lively city with a variety of attractions to offer. The bustling city is filled with magnificent palaces, diverse cuisine from world-class restaurants to street stalls and shopping malls. City highlights on your doorstep include MBK and Siam Shopping malls, Siam Ocean World and Madame Tussauds Wax Museum, Jim Thompson House. Just steps away from the BTS SkyTrain station, guests have convenient access to all the city has to offer. Located on the 8th floor, the breakfast venue offers an extensive international buffet menu of local and international cuisines to enjoy inside or on the outdoor terrace. Located on the 9th floor of the hotel with a cozy lounge and garden terrace overlooking the vibrant city of Bangkok. Sky Terrace bar, featuring Grand Vins selection of international wines, refreshment and light meals for all-day dining. All day snacks and beverages complimentary. Selection of books and magazines to enjoy at your leisure while sitting in lounge or outdoor terrace. 7.00-22.00 hrs. Cocktails and refreshments 07.00-22.00 hrs. Tidy room. Modern and clean. I would like to recommend this hotel for people who prefer to stay in down town Bangkok and close to BTS station. The BTS station (National stadium) is right in front of the hotel. This hotel also has 7-Eleven in the ground floor and easy to walk to the shopping centers in Bangkok: MBK, Siam Square, Siam Center, Siam Paragon and Central World. Thumbs up to Mercure Bangkok Siam. Am a regular guest and have been coming back to Mercure Bangkok Siam again and again for countless times already (once every couple of months). Everything was good and in order this time. Still loving the hotel and will continue to come back. Everything was great as usual. will be booking my stay with Mercure Bangkok Siam again for my stay next month! As always, your hotel is my choice of accommodation in Bangkok. Ideal location, very friendly staff at reception, restaurant, concierge, house keeping and lounge and level 9 bar. Do continue to maintain good service level! I am an accor plus member for 9 years already. I have always booked my hotel stay using my card. This is the first time that the front desk told me to show them the credit card I used to pay for my bill. What is the reason for this, my stay is already fully paid by my card company. I also saw another guest the following day arguing on this same issue. Being a card member, they have all my personal details already. This is also the first time, after so many hotel stays in other countries, that they asked me to put up a deposit by swiping on my credit card. I feel no privilege by my being a accor card member. This is the only hotel that I have stayed that does not honor you being a accor plus member for so many years. They treat you as any other hotel guest! Located right at the BTS Sky Train station "National Stadium", it's easy and cheap to get there to and from Suvarnabhumi airport (Airport Link and then BTS). There's also a 7-Eleven right on the ground floor in the building which is perfect for getting enough hydration before and after a day trip and anything one needs around the clock. The BTS also offers a lot of options to get around comfortably and at low expenses, such as to Sathorn pier to catch the river boats to go see the different sights. At the same time it's walking distance to Siam square where a lot of shops, malls, restaurants are just at your doorstep. The MBK mall, for instance, is literally only like 3 minutes away walking distance with an insane number of shops and food courts inside. The odd thing about the hotel room was that there was no hand soap provided so we just used the shower gel instead... There was also no free bottled water provided in the room, which, from experience, is usually included in other hotels. Otherwise, everything was fine - breakfast has both Western and Thai cuisine to offer with daily variations in the choice of dishes served. The hotel has a great central location and is on top of Ibis hotel, so it has very nice veiws of Bangkok from the rooms. Further theres is a good sky bar with swimming poole and fittness. Only downside is some noise from the aircondition. Great location with great service. Execellent service by front desk and big highlights for the bellman on ground floor. First impression a bit bold like budgetary room. Toiletries meagrely presented. Have to request specify items one at a time handed. Good view room in West side. No headed shower. I have forgotten to ask the receptionist she was so accomodated when I have asked for late checkout from 3:pm but she has offer and has made me feels so happy that due to our status no problem to leave till 5pm. She is the asset of Mercure love that. Bar captain Prarinya is also accomodated well. Thank you Mercure we like the one we stayed @Naples too. Everything's good but the shower ... Please increase the water volume is a BIGGGG disappointment. Unfriendly staff. Not interested in heloung guest with any questions. It was very pleasant stay with you all. All the arrangement are perfect especially the small decoration in the room for my friend's birthday. The only thing I would like to highlight is that the glass door for bathroom cannot close properly and the water will flow outside. Other than that, everything was great! I’m very happy with my stay experience with your hotel. Actually twice at your executive floor and likely another one coming soon. Keep up the good work. Great hotel in a great location. Everything was very clean and the room top infinity pool was a amazing! Great place to cool off from the Bangkok heat. The staff was also very friendly. The lobby receptionist, I forgot her name, is very nice and helpful, explained the rules for us and recommended the nice restaurant for us. And the bell service are very good and helpful. It's very good hospitality experience and I would like to recommend this hotel to my friend. Mercure Siam should be my first choice when I stay Thailand. Thank you very much. See you next time. Nice location and BTS nearby. Staff very helpful and friendly. Quite an expensive stay, but well worth the money, the cleaning crew upkeeped the room very well. But the staff are rather cold, Bangkok people on the streets seemed to have lost their Friendliness, but this should not be happening in 4 star hotel. Great location and friendly staff. Only opportunity is a bigger spread for breakfast.